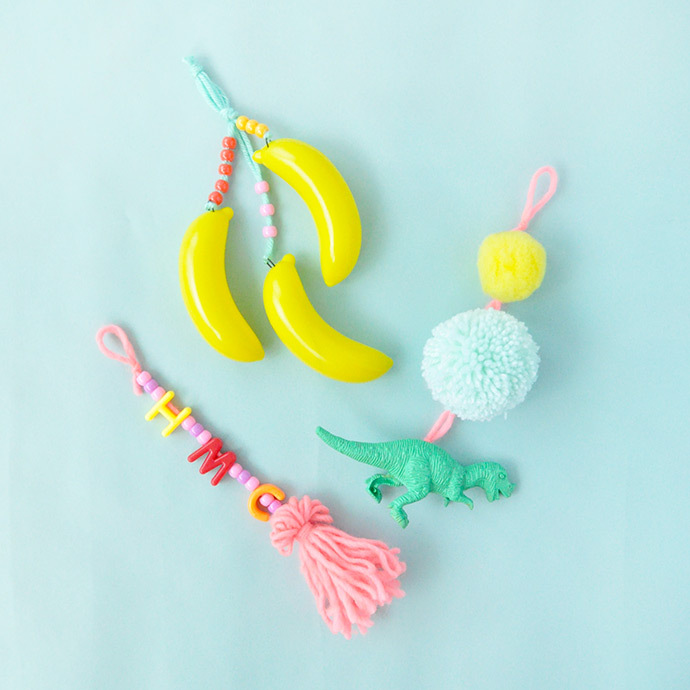 These tags are bananas, B-A-N-A-N-A-S! 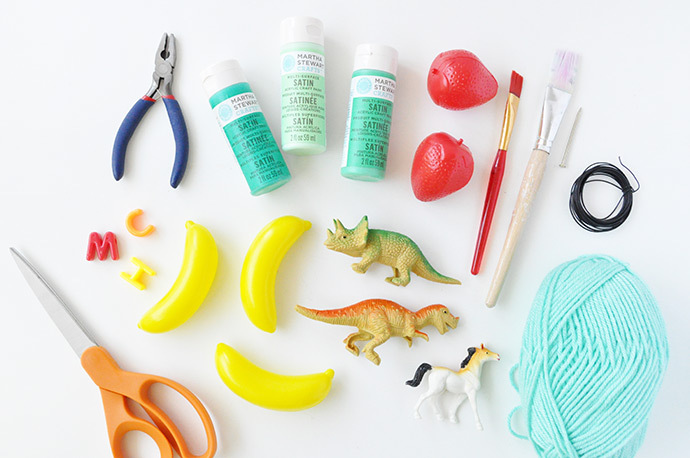 At least these ones are – you can use whatever plastic toys you have laying around! Make these customized luggage tags for all your adventures this summer – summer camp, family vacation, sleepovers, or even back-to-school! We’re sure that no one else will have the same tag, so you’ll be able to identify your luggage or backpack right away. The fun part about this project is that it’s totally customizable! 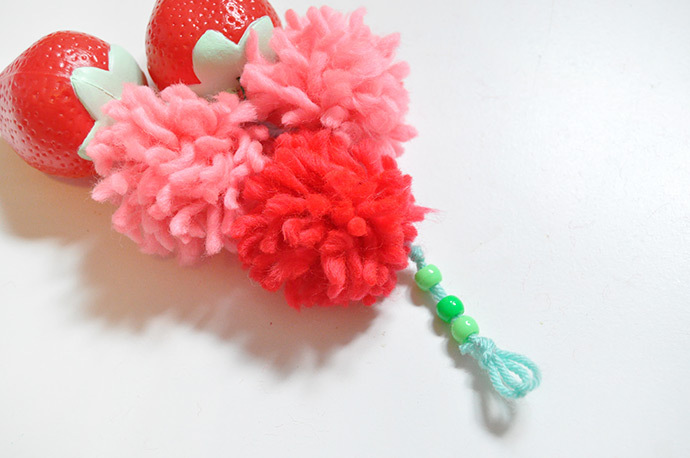 Gather up and extra odds and ends that you want to use, mix in a few pompoms and beads and you’re good to go. 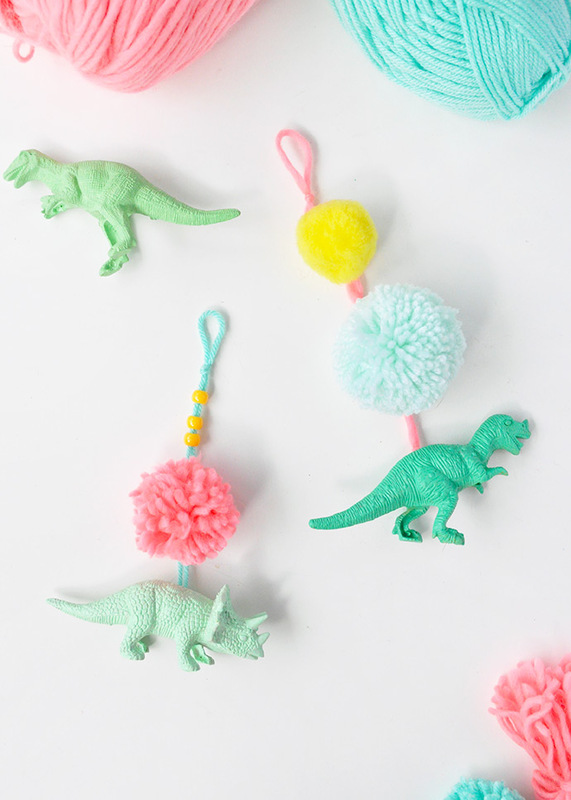 Keep reading to see how we made these ones and learn how to make some all your own! 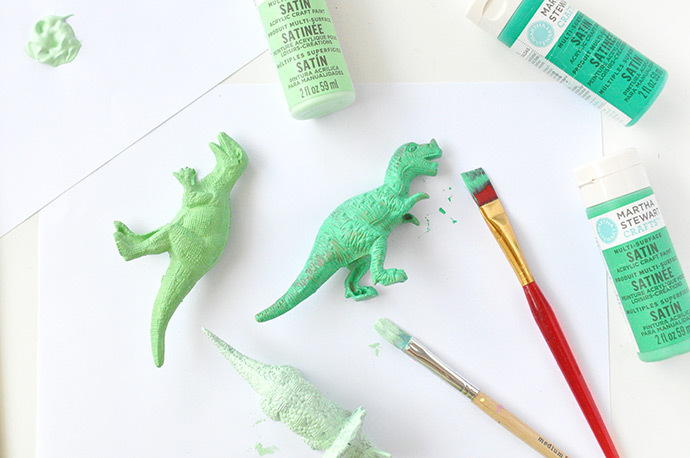 Start by painting your plastic toys – we gave each of the dinosaurs a solid coat of green paint. 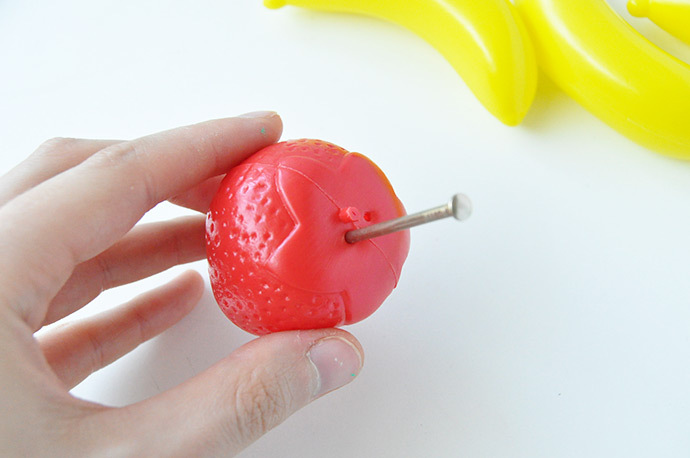 Use a nail or safety pin to pierce holes into the top of the toys. 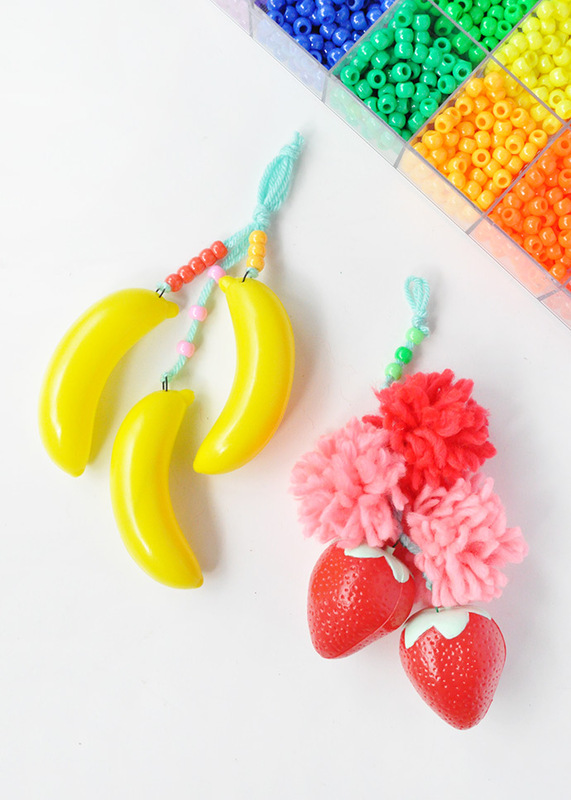 This will only work if the toys are thin plastic and hollow – otherwise you can try using a drill, or hot glue later to attach the cord. 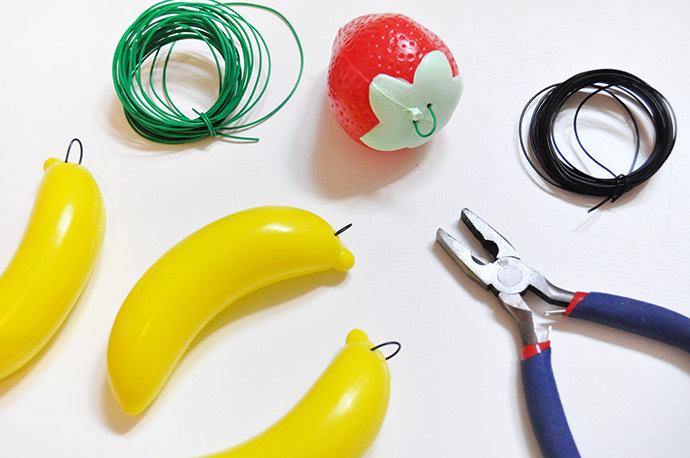 Cut and bend wire to form loops in the top of the toys. Secure by wrapping the wires together if you can to form a strong wire loop, or use hot glue. 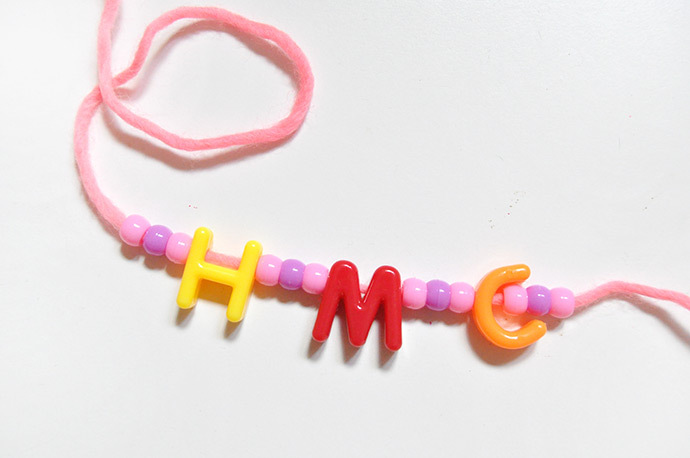 For the monogrammed luggage tag, simply thread alphabet beads and regular pony beads onto a piece of yarn or cord. If you’re going to be using this tag on checked luggage, we suggest using a stronger string, rope, or paracord just to be on the safe side. 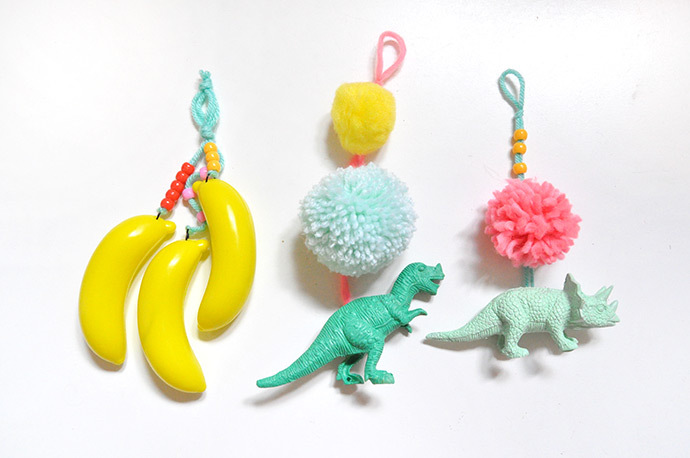 For backpack charms or tags, yarn should be strong enough. 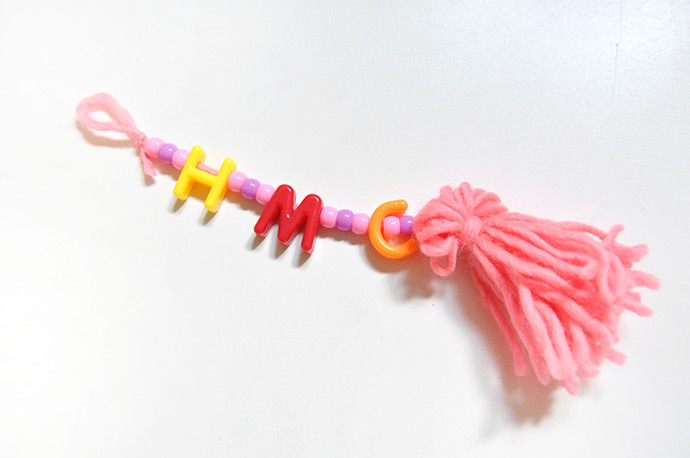 To finish off the monogrammed tag, make a tassel out of yarn. 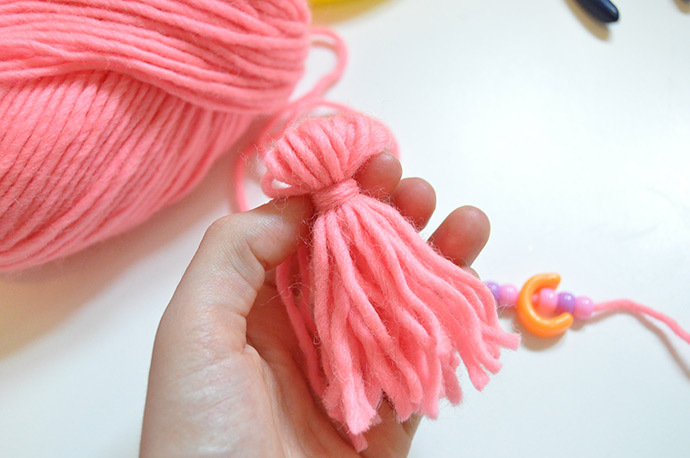 Tie the tassel to the end of the tag, and then form a secure loop on the other end. Attach onto a safety pin, keychain, or carabiner to attach to your luggage or backpack. 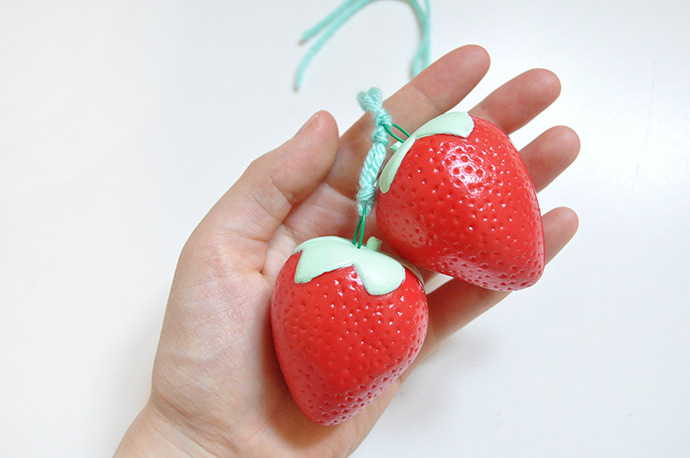 For the strawberries, tie yarn loops through the wire loops on the berries to secure them in place. 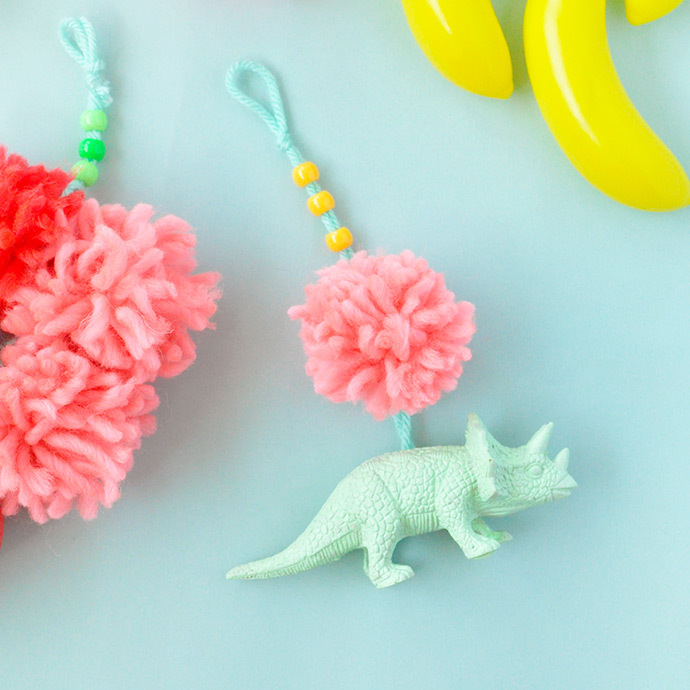 Decorate the rest of the cord with pompoms and beads. Don’t forget to make the loop at the top! 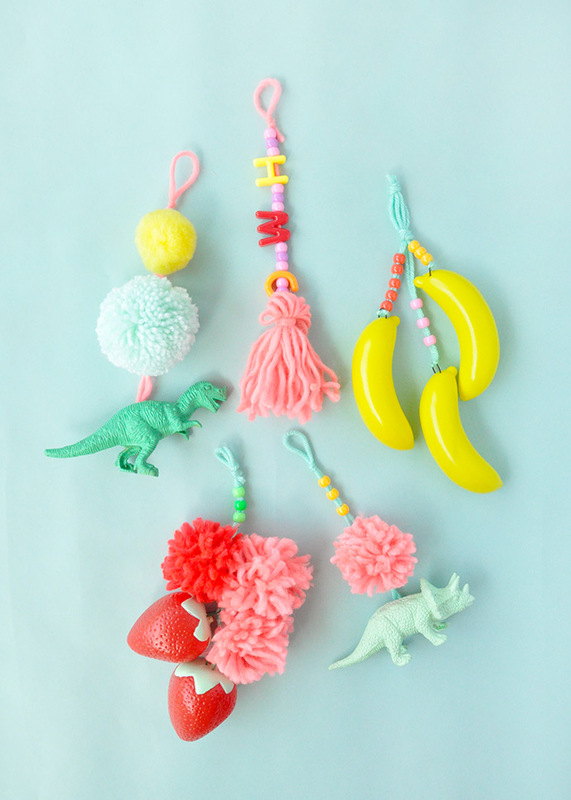 There really isn’t a right or wrong way to make these playful tags – just add toys, beads, pompoms, and anything else you want to make a completely custom luggage tag! These luggage tags look amazing! 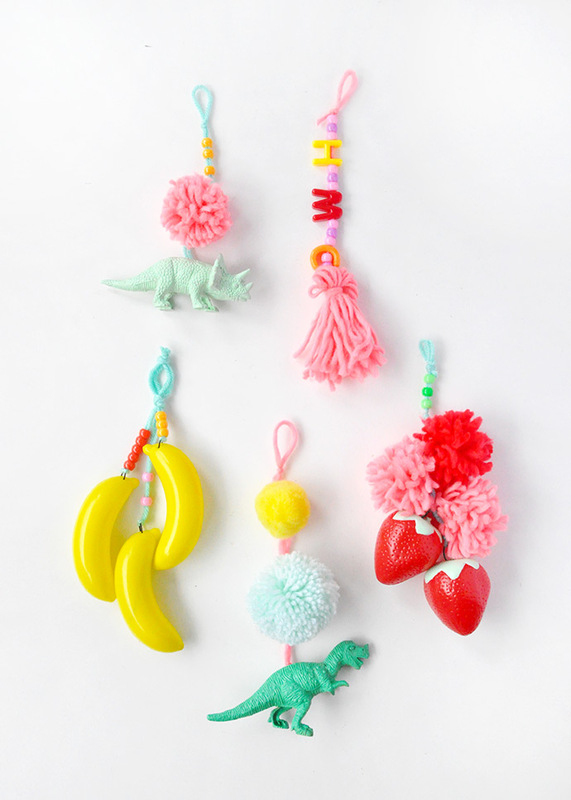 I totally want to make some for our kids on our next family trip! 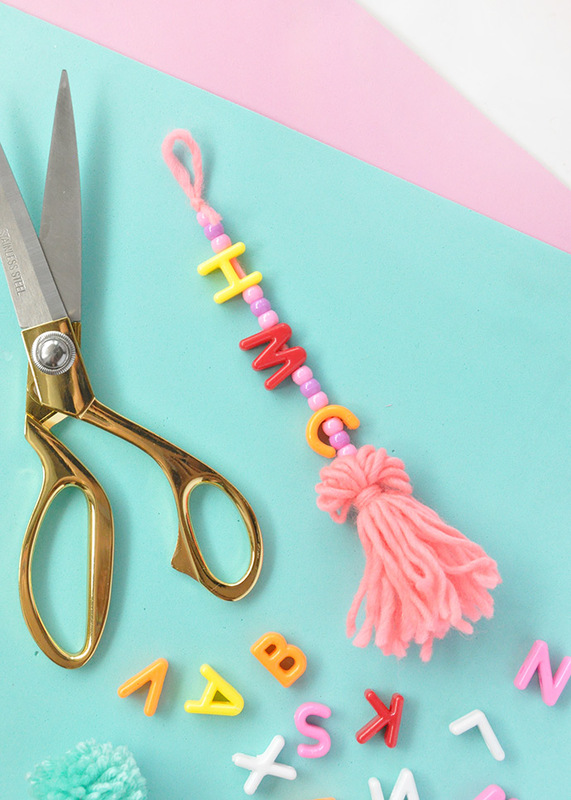 DIY luggage tags are a quick and easy project that will have even the most fearful-of-flying ready to take off! Plus, imagine how easy it will be to spot your bag on the carousel? Major bonus!